On March 13, 2015, Tri-City Fighting Series hosted NATIONS COLLIDE another AMAZING sold-out show! This card feature Alex ROZICKI (caged Dragon, Brantford, ON) vs Matar LO (OAMA, Ottawa, ON) for Provincial WKF Ontario 71 KG Muay Thai Title fight. Alex ROZICKI put his title on the line against Matar Lo – this fight went all 5 rounds, both fighters giving their all! 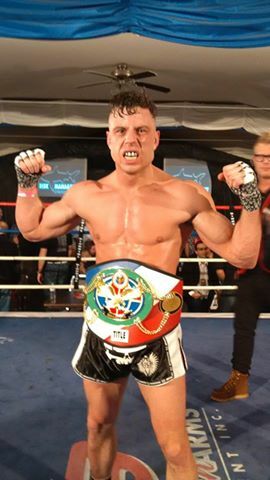 Alex ROZICKI continues to hold the Provincial WKF Ontario 71 KG Muay Thai Title! Congrats Alex! Also on this show, an amazing cross border match-up for the first ever – Tri-City Fighting Series 50kg Women’s title!!! Maggie TUCKER (MAS, Cambridge, ON) vs Emily SCHMITT (Team Toro, Chicago, IL, USA). Congratulations to Maggie TUCKER!